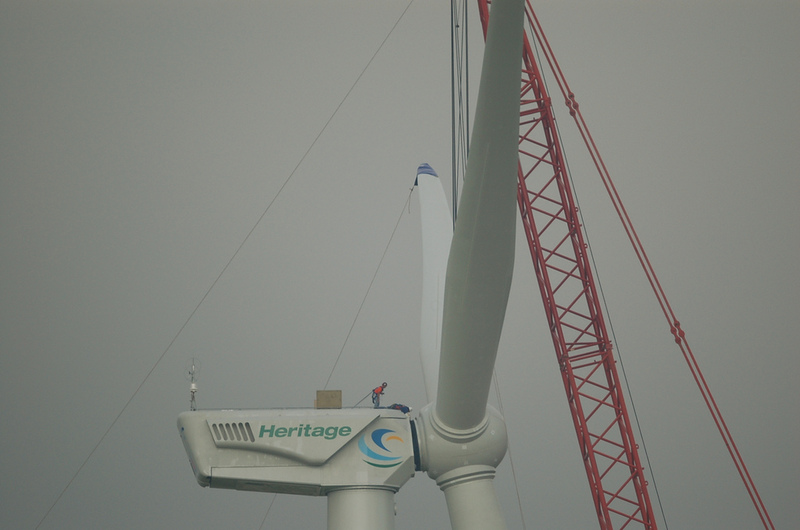 A wind turbine under construction in Michigan in 2008. After nine years of commercial wind energy development, Michigan State University researchers say they now have a better sense of what drives support — and opposition — for projects across the state. Late last month, Michigan State University Extension released an updated set of guidelines and a sample zoning policy meant for communities as they craft local wind regulations. It is the first update to the guidelines since 2008, and also includes more detailed considerations for noise and shadow flicker. Additionally, case studies in west and mid-Michigan counties show how projects can succeed when proper zoning processes are followed and developers work closely with landowners in initial stages. Since 2008, hundreds of turbines have been installed to meet the state’s original 10 percent renewable portfolio standard, and projects have been met with varying degrees of support. The guidelines began as recommendations from a wind working group that started convening in the early 2000s. They can be analyzed on a local basis, as Michigan — unlike states like Ohio — does not have statewide zoning rules for wind energy. Among the top areas of research has been the impacts of noise on nearby residents, Neumann said. Members of the original wind working group based recommendations on a 55-decibel threshold — “beyond that, the document was largely silent on measurement methodology, duration of measurement and some of the instrumentation. It was just a crude standard that in practice is quite difficult,” Neumann added. While the guidelines don’t specify a value for local regulations to follow, Neumann said “human health impacts are minimal, if at all” in levels at the 40-45 decibel range. And still, these are numbers most associated with nuisance rather than negative physical impacts, he added. Between March and August of this year, later drafts of the guidelines delved deeper into sound measurement methodology to be “more explicit” for communities, Neumann said. John Sarver, of the Great Lakes Renewable Energy Association, helped convene the original wind working group in 2003. He says regulations have evolved compared to what was essentially a lack of a template then, particularly on sound. In addition to health, researchers in Michigan and throughout the U.S. are delving further into the circumstances that drive support and opposition for wind projects. This includes how developers interact with communities in the early stages of projects, as well as how royalties are divided among landowners. Wind development in Gratiot County in mid-Michigan is often cited as one that succeeded based on community buy-in and an active developer compromising with property owners. The report also cites a development in Mason County, in west Michigan, that was able to overcome strong, vocal opposition after local officials “stayed within the realm of substantive due process requirements” and presented “accurate, science-based” information to overcome legal challenges. The guidelines also note that, in areas where wind development has been polarizing, “education on a topic like this can be somewhat limited in its effectiveness,” Neumann said, unless done early by an unbiased party. Sarah Mills, a postdoctoral fellow at the University of Michigan’s Center for Local, State, and Urban Policy who also reviewed the updated guidelines, has spent years surveying rural Michigan residents who live among wind turbines. With guidance available, she said she still sees a patchwork of ways communities approach development, suggesting specific zoning numbers don’t necessarily drive support for projects. Mills has also seen an uptick in royalty payments that expand the pool of landowners who receive money from development — not just those with wind turbines on their property. Yet one of the key takeaways from the guidelines is that local zoning — through setback distances, noise levels or height limitations — can’t restrict development to the point of excluding it. “Given the need for reliable, clean energy, as prescribed in the Michigan Clean, Reliable, and Efficient Energy Act of 2008, (and the omnibus legislation adopted in 2016) it is unlikely that a local unit of government could successfully argue in a court of law that there is not a demonstrated need for utility scale or home-use wind energy systems, and therefore such systems may be effectively banned through overly restrictive and unreasonable zoning regulations,” the guidelines say. However, the degree to which new wind projects meet that target is uncertain, particularly as the cost of utility-scale solar declines. Some officials in the Thumb region have claimed there’s a saturation point for turbines and have passed moratoriums to halt development. DTE Energy has also said its future wind development there may be limited. “It takes a unique approach within the community to do an assessment of what might be the right landscapes or locations for wind or solar in order to minimize some of the land-use conflicts,” Neumann said. Sarver is confident that the steadily declining costs of wind in Michigan along with the new renewable energy standard will lead to more development, despite opposition in places like Huron County in the Thumb, where roughly 500 turbines are operating or under construction. Sarver added that there’s always a looming debate in Michigan about offshore wind resources in the Great Lakes, a topic no less controversial than onshore development.